Supply Chain Management « Global Market Insights, Inc. Endorsed with a rich portfolio of digitally empowered consumers, artificial intelligence in retail market has been acclaimed as one of the most progressive verticals in the recent years. In the year 2017, this business space registered a global share of USD 650 million and is forecast to record a CAGR of 40% over 2018-2024, which is indeed humongous. With retail space becoming affluent with more number of e-commerce platforms as well as startups with huge technology appetite, the adoption of AI in retail market is bound to proliferate. 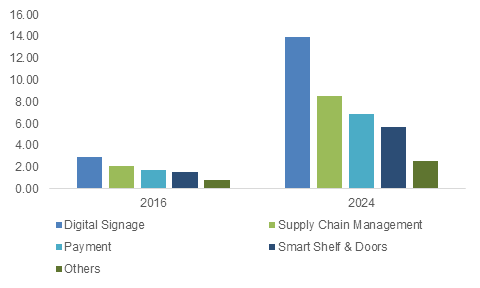 Add to it, the technology is witnessing a slew of opportunities in sync with the hi-tech trends including the like of blockchain, AR, and Internet of Things establishing its footprints in the retail domain. Amidst all these tech interventions, the focal point of this consumer-driven industry remains delivering unrivaled shopping experience to the customers as well as ensuring optimal management of resources and stocks. One of the classic examples of leveraging the AI technology is of Baidu, China’s renowned artificial intelligence market player. The company grabbed the headlines with its attempt to promote its AI technology in aiding convenience stores manage their food stock more efficiently and resourcefully. For the record, the search engine giant has been supporting Ping++, an AI service provider since September 2017 to work with Today, convenience store chain with regard to a fresh food project. Under the terms, the company utilizes PaddlePaddle, a deep learning platform by Baidu along with its CTR model. Reportedly, the implementation of these technologies had a positive impact on the sales, post which Baidu introduced this model to dozens of stores for testing. In testing stores, the profits surged by 20% and food waste dropped by 30%. The instance vividly portrays the huge scope of artificial intelligence in retail industry. Since the past two years Baidu has invested over USD 1.5 billion in AI research in addition to its investment of USD 200 million for the development of a new R&D facility. In fact, the Chinese market having the three most powerful names of the retail and tech space – Alibaba, Baidu, and Tencent (collectively touted as BAT), is betting big in the global AI in retail industry space. 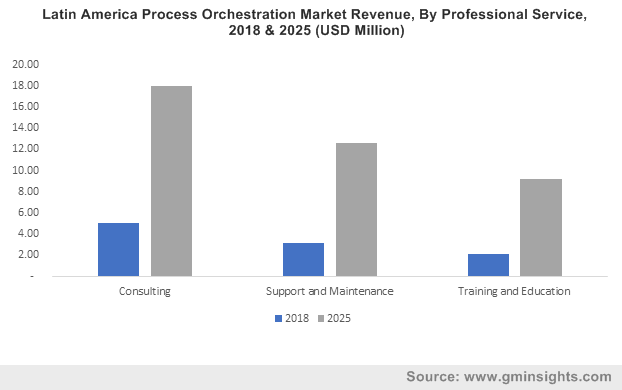 The three giants which are claimed to have a cut throat competition with the U.S. in terms of resources and capital are positioning themselves to become the ‘future AI platforms’. The trio is also expanding in other Asian countries and investing heavily in U.S. based AI startups to leverage the power of AI. Backed by such powerful initiatives and presence of these conglomerates, APAC AI in retail market is forecast to be the fastest growing region, with an anticipated CAGR of 45% over 2018-2024. 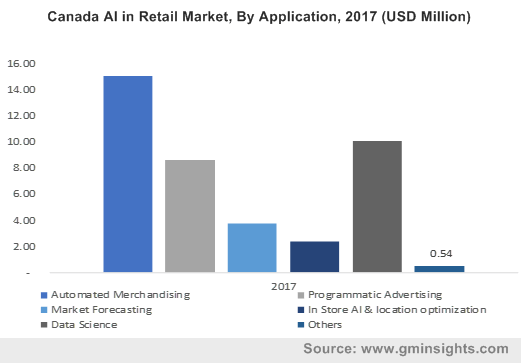 Further elaborating on the geographical trends, North America having procured more than 50% of the global share in 2017, has been leading the regional landscape of AI in retail market. U.S. has a major credit in the phenomenal regional trends with over 65% of investments (including M&As, private equity, and venture capital) in artificial intelligence technology. Add to it, the region is a major hub for startups in tandem with the presence of tech titans such as Google, IBM, and Microsoft. Analyzing the aforementioned trends and the penetration of AI in retail industry, it is overt that the traditional retail model is bound to witness a disruption of sorts. The technology penetration will reshape the entire inventory management and operation cycle of the retail stores, thus providing a renewed shopping experience to the customers. Not only the efficiency and sales of the retail space will see an upsurge but through the proliferation of AI in retail market, the worldwide economy will progress massively, opening doors for several hi-tech startups and a plethora of new job opportunities. In terms of profitability scope, the overall AI in retail industry share is anticipated to surpass USD 8 billion by 2024, with untapped economies gaining major traction in terms of investment. This entry was posted in Sustainable & Smart Technologies and tagged AI in Retail Business, AI in Retail Market, Artificial Intelligence in Retail Market, Artificial Intelligence in Retail Sector, Automated Merchandising, Chatbot, Component, Computer Vision, CRM, Customer Behavior Tracking, Customer Relationship Management, Data Science, In-Store AI & Location Optimization, Inventory Management, Machine Learning, Managed Service, Market Forecasting, Natural Language Processing, NLP, Price Optimization, Professional Service, Programmatic Advertising, Recommendation Engine, Retail AI Market, Service, Solution, Supply Chain Management, Visual Search.